I have two favorite weather sites. The first is www.weatherunderground.com which offers live Doppler radar access including animated loops with storm tracks that give you live data on how high thunderstorms are, predicted hail size, wind speed, etc. It is both fascinating and useful. The second site I like is the National Mosaic Enhanced Radar Image Full Resolution Loop. It shows a live loop of all the combined weather radars in the country and is really interesting when major storms develop across the country. It is very large and won't fit on my whole screen. There is a smaller version also available. This system can also be used to track bird migration via radar in the spring. The photo below has been making the rounds on the internet in the last month. It was taken by Atmospheric scientist Oscar van der Velde of Sant Vicenç de Castellet, Spain on June 5th. It is a photo of an atmospheric phenomenon called a sprite. 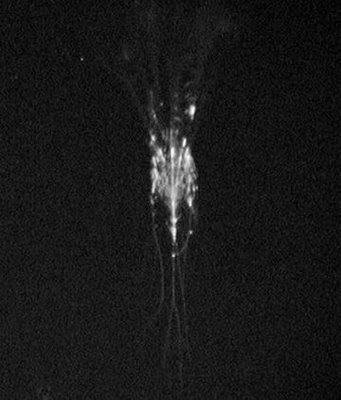 Researchers at the University of Minnesota first photographed sprites in 1989 and now amateurs are doing it from home. Sprites are sometimes called lightening but unlike the lightening we are familiar with, sprites occur very high in the upper atmosphere, about 50 miles up, and are not hot. They are cold plasma phenomenon similar to what happens in a fluorescent light. They are triggered by cloud to ground lightening strikes in thunderstorms far below. Sprites are only triggered by positive lightening strikes which are rarer and higher energy than the standard negative strikes. You too can watch for sprites. You need to be in the dark countryside and have a large mesoscale thunderstorm about 60 miles away. There needs to be clear skies between you and the storm. Shield your eyes from the flashes of in-cloud lightening and look above the distant cloud tops for the flashes of sprites. They are very short flashes but they can be captured with cameras. You can see more interesting photos here.